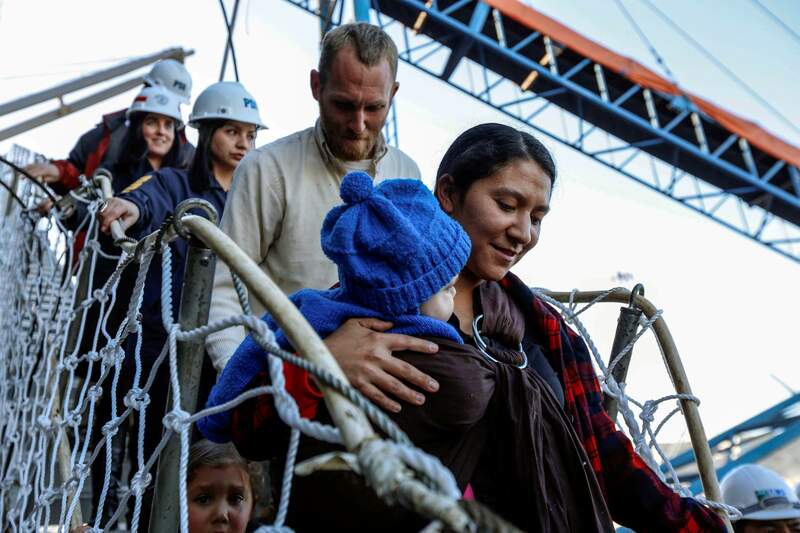 Religious followers were trying to leave the U.S.
Hannah Gastonguay, holding her baby Rahab, is followed by her husband, Sean, and the couple’s 3-year-old daughter Ardith, as they disembark in the port city of San Antonio, Chile, on Friday. The northern Arizona family was lost at sea for weeks in an ill-fated attempt to leave the U.S. over what they consider government interference in religion. PHOENIX – A northern Arizona family that was lost at sea for weeks in an ill-fated attempt to leave the U.S. over what they consider government interference in religion will fly back home today. The months-long journey has been “pretty exciting” and “little scary at certain points,” Gastonguay said. Hannah Gastonguay said her family was fed up with government control in the U.S. As Christians, they don’t believe in “abortion, homosexuality, in the state-controlled church,” she said. The Gastonguays weren’t members of any church, and Hannah Gastonguay said their faith came from reading the Bible and through prayer. “The Bible is pretty clear,” she said. The family moved in November from Ash Fork, Ariz., to San Diego, where they lived on their boat as they prepared to set sail. She said she gave birth to the couple’s 8-month-old daughter on the boat, which was docked in a slip at the time. In May, Hannah, her 30-year-old husband, Sean, his father, Mike, and the couple’s daughters, 3-year-old Ardith and baby Rahab, set off. They wouldn’t touch land again for 91 days, she said. The boat had taken a beating, and they decided to set course for the Marquesas Islands. Instead, they found themselves in a “twilight zone,” taking more and more damage, leaving them unable to make progress. They had been on the ocean for about two months and were low on supplies. They were out of food and were down to “some juice and some honey.” She said they were able to catch fish, but they didn’t see any boats. Still, we “didn’t feel like we were going to die or anything. We believed God would see us through,” she said. At one point, a fishing ship came into contact with them but left without providing assistance. A Canadian cargo ship came along and offered supplies, but when they pulled up alongside it, the vessels bumped and the smaller ship sustained even more damage. “The captain said, ‘Do you know where you’re at? You’re in the middle of nowhere,”’ she said. Sean Gastonguay’s brother Jimmy, who lives in Arizona, said he had provided a description of the family’s vessel to the U.S. Coast Guard and exchanged emails with them once they were picked up by the first boat. “There was some concern, but we were hoping for the best, and they eventually popped up,” he said. He was able to keep track of the family with the help of the Coast Guard as they were transferred from ship to ship. “We’re all happy. We have good peace of mind now,” he said.